Be the first to share your favorite memory, photo or story of Mrs. Synthia. This memorial page is dedicated for family, friends and future generations to celebrate the life of their loved one. 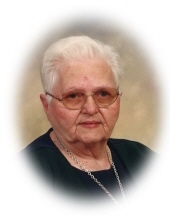 Mrs. Synthia Margaret Loner, age 90, of Carrollton, Georgia passed away Sunday, January 27, 2019. Mrs. Loner was born in Heard County, Georgia on September 10, 1928, the daughter of the late Miles Milton Benefield and Jeanetta Evelyn Davis Benefield. She was a retired LPN from Tanner Medical Center and Dix Nursing Home after 60 years of service. She was a member of Calvary Baptist Church in Bremen, Georgia. Survivors include her sons and daughter-in-law, Jack Holdridge of Simpsonville, South Carolina, Melvin and Jackie Holdridge of Carrollton; daughters, Patricia Landham of Hiram, Shelah Easton of Covington, Ellen Daniel of Bremen; 11 grandchildren, 19 great grandchildren, one great grandchild; brother-in-law, Brent Eanes of Newnan and daughter-in-law, Mary Holdridge of Roosterville. Besides her parents she was preceded in death by her husbands, Earl W. Holdridge and Henry Loner; son, Richard Holdridge and a sister Emma Jean Eanes. The family will receive friends at Almon Funeral Home Thursday evening from 6 p.m. until 8 p.m.
Funeral service will be Friday, February 1, 2019 at 2 p.m. from the chapel of Almon Funeral Home with Dr. Howard Mills and Rev. Michael Murray officiating. Pallbearers will be Robert Waldorf, John Massey, Cody Massey, Aaron Waldorf, Chris Massey and Adam Billingsley. Interment will be in Happy Hill Baptist Church Cemetery. Memorial contributions may be made to Embrace Hospice, 216 West Wilson Street, Villa Rica, Georgia 30180. Messages of condolences may be expressed to the family on line at www.almonfuneralhome.com. "Email Address" would like to share the life celebration of Mrs. Synthia M. Loner. Click on the "link" to go to share a favorite memory or leave a condolence message for the family.